Double Roaming Wilds means Double Happiness for players who take to the reels in this fast-paced pokie from Aristocrat. Those double roamers appear in this game’s fantastic Free Spins feature, where a whole multitude of prizes await. But let’s give some credit to the main game too, which offers plenty of thrills and excitement in the traditional Aristocrat fashion. With five reels servicing 25 paylines each and every spin feels like it could be a good one, and while there are plenty of lucrative main game prizes to be won it is those scatter symbols you will be looking out for in order to trigger that outstanding freebies round. Double Happiness kicks off with the ubiquitous playing card symbols, with the Nine and Ten paying 5 coins, 20 coins and 100 coins for spinning three, four and five respectively. Then there’s the Jack and Queen, who earn 10 coins for a treble, 30 coins for a quadruple and 150 coins for a quintuple. Of the playing card symbols it is the King and the Ace which are the most generous payers, predictability as they top the card food chain, and these award players with 20 coins, 50 coins and 200 coins for three to five. And then we’re into the more graphical symbols. The first, which is a set of Cymbals, will drum up some decent rewards including 25 coins for three, 100 coins for four and a top prize of 300 coins for five. The Chinese Lantern is a favourite of Oriental themed pokies, and in Double Happiness it is much-loved by players too. That’s because it rewards players for matching three (25 coins), four (100 coins) or five (400 coins) on an active payline. Of course, no Oriental celebration is complete without Firecrackers, and in this pokie these will light up your reels and deliver 30 coins, 150 coins and 500 coins respectively. You’ll be making a hell of a racket if five of the Drum symbol appears on your reels, and that’s because you’ll trouser 750 coins for the privilege. There are payouts of 30 coins for three and 150 coins for four as well. And finally, the last of the main game prizes in Double Happiness is that rather chipper-looking Chinese Chappy. He’s in a generous mood and will reward players with 5 coins (for two), 20 coins (three), 200 coins (four) and 1,000 coins (five). Of course, you can always gamble your base game wins for a chance to bulk them up a bit. Guess the colour of a upturned playing card to earn a 2x multiplier, or you can guess the suit and pick up a 4x bonus! The wild in Double Happiness is the Chinese Dragon, and this affords players two opportunities to profit. The first is through its payouts for spinning two (10 coins), three (100 coins), four (500 coins) or five (2,500 coins). This wild Dragon will also substitute for all other game symbols apart from the scatter to create additional wins for players. The scatter in this pokie is the Chinese Symbol, which literally translates as Double Happiness, and this will allow players to pocket 5x, 20x and 100x their bet amount for three, four or five. The scatter pays in any position too; there’s no need to line them up on a payline. And there will truly be Double Happiness in your household if you reveal three or more of the scatter, as the Free Spins feature will be triggered with 10, 15 or 25 freebies at your disposal. Two Roaming Wilds will appear and substitute for all symbols (bar the scatter). Each will move one position between each free spin, and if both of the roaming wilds appear in the same position and substitute in a win, that prize is subject to a 10x multiplier! A scattered Double Happiness appearing beneath a roaming may contribute to a scatter prize, and the best news is that the Free Spin feature can be re-triggered with three or more scatters. 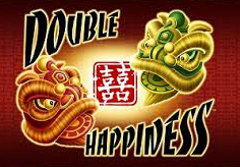 That’s the thing we love the most about Double Happiness: a generous Free Spins game and that profitable Roaming Wilds set up. This combination can create some eye-popping prizes; you’ll be double happy if you spin them.